Just like 24 hours ago the top spot was taken by Austria’s Christian Deuschl who landed on 137.0 meters and gathered 137.5 points. That meant a 15 second advantage over the closest competitor, Sindre Ule Soetvik of Norway (133.0 m., 133.7 p.), before the second part of the competition. Next three athletes on the rank list also came from Norway. Petter Loeset Skodjereite (129.0 m., 133.1 p.) trailed 18 seconds and both Leif Torbjoern Naesvold and Harald Johnas Riiber trailed 58. 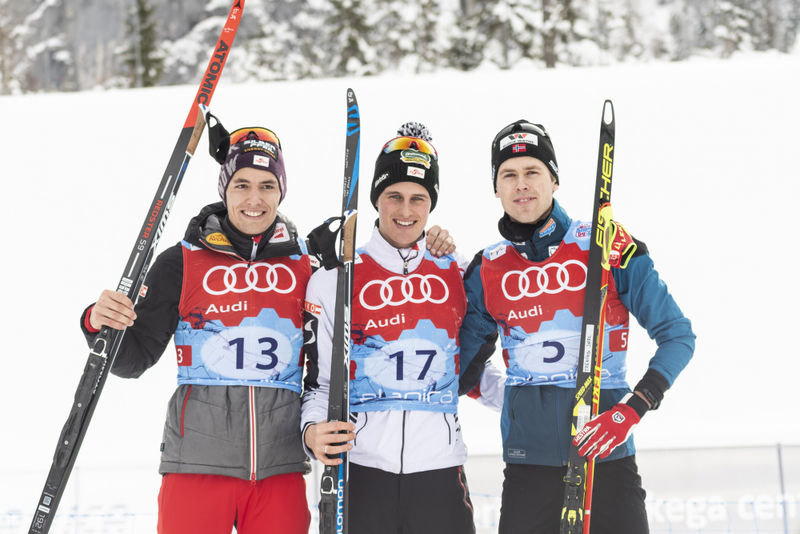 The best Slovenian jumper was Marjan Jelenko, who finished in 9th place and started his Cross-Country race a minute and 18 seconds after the leader. The conclusion of the competition turned out to be interesting since nine athletes entered the last 2,5-kilometer lap together. But at the end Austria’s Paul Gerstgraser switched to a higher gear and comfortably took the victory ahead of he’s teammate Thomas Joebstl. Gerstgraser who was 17th after the jumping round crossed the finish line 7.8 seconds before Joebstl. Riiber managed to take the third place with a 12.4 second lag behind the winner.